Ideal for Supplemental Heat Applications! Choose either natural gas or liquid propane. HearthRite Vent Free Heaters are 99.9% fuel efficient. Because they don't require outside venting, no heat is lost. And best of all, HearthRite Vent-Free units do not require electricity to operate. Space-saving efficiency and convenient top-mounted controls make the HR18TN the outstanding heater to add radiant heat to your smaller rooms. 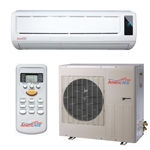 Thermostats Offer Balanced Temperature Control. The HR10T, HR15T, HR18TN, HR25T and HR30T are thermostatically controlled from full input down to pilot. Turn the unit on and let the thermostat cycle the heat. 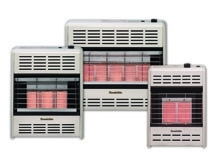 HearthRite Vent-Free Heaters offer convenient, easy to operate controls on the top of the unit. The push button igniter lights the pilot, eliminating the need for matches. Each unit is test-fired in the factory and contains an oxygen-depletion sensor that shuts off the unit if not enough fresh air is available. HearthRite Vent-Free heaters are whisper quiet and use a state-of-the-art powder coat process that produces a durable, scratch-resistant finish. Of all heating sources available, clean, efficient gas heats an area for less than half the cost of electricity. And, in the event of a power outage, gas space heaters, keep your house warm and cozy. Width LP Inches 19 1/2"
Height Nat. Inches 23 1/2"
Minimum Clearance From Top Inches 24"
Minimum Clearance From Side Inches 6"
Minimum Clearance From Floor Inches 2"